In this release, it is possible to provide remote configuration to connect to platforms when on a non-local network. 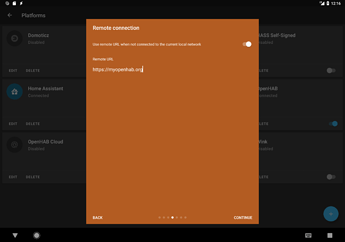 Remote connection supported for Home Assistant, OpenHAB and Domoticz integrations. That includes myopenHAB and Home Assistant Remote UI. Local network is determined by Wifi network name and recorded during platform setup process when connection test is performed. If local network name would change, please go through platform setup process again to update the network name.